Blood protein is measured as part of routine blood work, and is also used to diagnose and evaluate patients with cancer, immune disorders, malnutrition and digestive disorders, and diseases of the liver, kidney and intestines. For adults, normal levels of total protein are between 6.4 and 8.3 grams per deciliter (g/dl). (Reference values may vary from lab to lab.) Low protein is caused by malnutrition, malabsorption, overhydration, liver disease, immune deficiency and some drugs. Albumin and globulin are the main proteins found in blood. Albumin accounts for about 60 percent of total protein. It functions as a transport for enzymes, hormones and drugs. Albumin also accounts for the "colloidal osmotic pressure," which is responsible for keeping fluid within the vessels. Globulins are the main building block for several substances, including antibodies, glycoproteins, lipoproteins, clotting factors and other components of the immune system. They also act as transport proteins. Together, the levels of albumin and globulin make up the total blood protein level. These proteins can also be measured separately. Amino acids are the building blocks of proteins. Humans can produce 10 of the 20 amino acids, but must take in the others through diet. If a person's diet lacks protein or any of these amino acids, his body cannot make albumin and globulin, resulting in low blood protein. Conditions that affect the intestines can reduce the body's ability to absorb proteins from food. These are known as "protein-losing enteropathies," because the proteins are lost from the intestines rather than digested. Crohn's disease, Celiac disease and Whipple's disease can all damage the intestines, resulting in low blood protein. Renal disease can damage the filtration system of the kidneys, causing protein to "spill" into the urine and be lost to the body. Blood protein levels are measured as the concentration of proteins per deciliter of blood. With overhydration, the blood volume increases, causing the protein level to decrease in proportion. The absolute levels of albumin and globulin are normal, but the ratio of proteins to fluid has decreased. Albumin and some globulins are made in the liver. When liver cells are damaged by disease, they cannot synthesize albumin. Thus total protein levels, and especially albumin levels, are used to diagnose and evaluate liver disease. 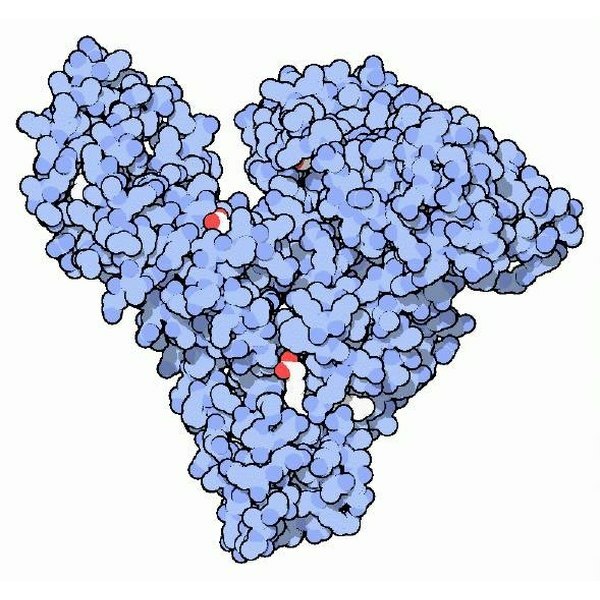 Globulin is the building block for immunoglobulins, the main protein of the immune system. With immune deficiency, the number of immunoglobulins is reduced, which decreases blood protein levels. Several pharmaceuticals can reduce total blood protein levels. Among them are estrogens, oral contraceptives and any drug that is toxic to the liver.